Make the trip of your lifetime! Explore our travel guide for Greece holidays and Greek islands hopping and discover this small corner of Europe that will offer you all the excitement and relaxation you need during holidays. Among the top tourist destinations in the world, Greece is the best place to lay under the hot sun, swim in exotic beaches, walk through picturesque places, see magical sunsets, visit interesting ancient site and sightseeing, stay in luxurious hotels and discover beautiful islands. There is no chance you won't find the most suitable place for you. Organize your Greece holidays in the Greek islands with the help of our travel guide of Greece and get quality information and services in many beautiful and popular destinations. Our Greece travel guide will help you organize your holidays in some of the most beautiful Greek islands and mainland destinations. We propose travel guides to many popular destinations with photos, best beach resorts, interesting sightseeing and local activities. Do you not know where to go? Find your Destinations by area or select your holiday location from the list. You will find bellow some sections that can help you find destinations according to your critiria. Alternatively, you can browse our travel guides for 90 Greek islands and mainland destinations, with photos, reviews and many information about sightseeing and beaches. General information that will help you organize your travel to Greece and the beautiful Greek islands but also travel services we offer in all destinations: Hotels booking, Greek ferries tickets, car rentals, tours, transfers, island hopping packages and more. We can help you make your Greek islands holidays an unforgettable experience. Do not hesitate to contact us for an offer! We will propose you a package designed according to your needs and budget. As a travel operator, we guaranty prices lower than those you would find individually. Have a look in our island tour packages. Departures from Athens, Santorini, Mykonos and Rhodes. Just send us your traveling details and we will reply with a complete offer for your Greek holidays. Book your hotel in Greece. Discover hotels in more than 90 beautiful destinations. Check ferry schedules to the Greek islands and book tickets through our online booking engine. We suggest car rentals in the most popular locations and at the best prices.. Discover our fantastic bus and boat tours to add some extra fun in your Greek holidays. Organize easily and quickly your transfers from the port/airport to your hotel. Find out useful information on how to organize your travel to Greece and the islands. 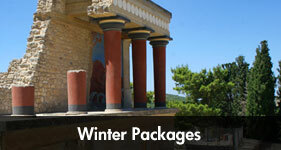 Discover hotels special offers and last minute deals as well as early booking discounts for tours in Athens. Discover the most beautiful Greek islands and destinations in the mainland. We have prepared detailed guides with travel information and photos for each island and destination separately. Cosmopolitan or secluded, all Greek islands provide the valuable relaxation you need during your Greece holidays. As every destination has its own beauty and culture, there is a suitable place for everyone! Discover our Greek island hopping guide to more than 60 popular destinations around the country. The destinations we propose are divided in islands group. Our Greece travel guide offers many photos and information about things to see and do, activities, restaurants, hotels, maps and more to plan your perfect Greek islands holidays. For even more amazing vacations, you can combine your travel in an island hopping with several islands in one trip. View our Island hopping packages. The Cyclades islands are the most popular and offer beautiful villages and beaches.View our guides of 23 islands including Santorini, Mykonos, Paros, Naxos. The Ionian islands offer fabulous sandy beaches with crystal waters and large mountains. View guides of 9 islands including Corfu, Kefalonia, Zakynthos. The Dodecanese islands offer beautiful beaches and historical monuments. View guides of 12 islands including Rhodes, Kos, Karpathos, Patmos. The islands of Sporades are surrounded by lush greenery with superb beaches. View our guides of 4 islands including Skiathos, Skopelos, Alonissos. These are the closest islands to Athens and the most easily accessible in few hours by ferry. View our guide of Hydra, Spetses, Poros, Aegina and Agistri. Crete island is the largest and certainly one of the most beautiful destinations to explore. Discover 4 popular areas of Crete including Chania and Rethymno. An other island group that worth to be visited is the Eastern Aegean islands: With mountainous landscape and family atmosphere, these islands offer beautiful beaches and villages. We offer guides of Lesvos, Chios, Thassos, Ikaria and other islands. However, Greece holidays is not only about island hopping. Our travel guide to Greece mainland suggest many amazing places to discover: historical towns like Athens or Thessaloniki, interesting ancient sites in Peloponnese (Mycenae, Epidaurus, Olympia, Mystras) or in Sterea (Delphi), gorgeous mountainous regions in Thessaly (Meteora, Pelion) or superb beaches in Halkidiki and Parga. Although the mainland is not as famous as the Greek islands for holidays, visitors who dare to go off the beaten track are eventually impressed with the different landscapes and the many opportunities for sightseeing. Lay on the soft sand, swim in crystal waters, visit interesting sites, taste delicious dishes and meet friendly people: this is what holidays is about! This section proposes general information about Greece and the Greek islands (thousands of photos, videos, the amazing beaches, villages and more) but also information about the rich local greek culture (traditions, religion, music, food, products and more), the entertainment (restaurants, bars, clubs) and the sports you can practice during your holiday (scuba diving, sailing, windsurfing, kitesurfing and more). Here are some interesting topics about Greece and popular sections in our website. Organize an unforgettable island hopping tour with Greeka and discover the most beautiful Greek islands! We guarantee you an easy trip saving money and precious time. Book your ferry tickets to the islands in 4 easy steps. Discover the ferry companies and make a search to find the best schedules. Also, ferries from Italy and to Turkey. A country with long history and rich culture, Greece is the best place for sightseeing. Many monuments in Greece are considered as UNESCO world heritage sites. Take part in our Photo Contest! 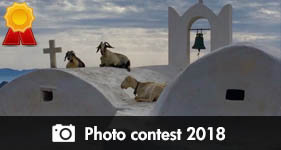 Take part in our Photo Contest uploading photos from your Greek holidays! Prizes include stays in luxurious hotels in Paros, Santorini, Naxos and Corfu, photo cameras and more. Are you interested in working in Greece? Have a look at our jobs section, where Greek businesses post their job offers. Most offers are valid for the summer season. Register in our Members Community and be part of our large company: upload your photos from Greek holidays, connect with other members and take part in our photo contest. Registration is free!